I was cleaning out my fridge (gross) and came across a 1/2 of a block of Velveeta cheese. For the life of me I cannot recall what I made with the other half, but I vaguely remember a recent kitchen memory of me cooking with my 15 year old and she was cutting 1/2 a block of Velveeta. It was wrapped properly and quite frankly I don’t think that stuff ever expires…. But I digress. I needed to come up with a recipe to use up that half a block of the orange gooey cheese. I know not everyone is a fan of Velveeta but hey, I am. So there! So, I whipped up this mighty tasty (if I do say so myself) recipe that I like to call Cheeseburger Joes. They are like Sloppy Joes only not so tomatoey (is that a word? Probably not). They are still sloppy though and taste mighty good. My 7 year old son Liam LOVES himself a cheeseburger and he LOVED this recipe and had 2 big ol honkin’ sandwiches. I served it with some baked beans on the side. It was delish! This is a recipe that does not actually take very long to cook in the slow cooker. You just need to cook it long enough to melt the cheese and let the flavors meld together a bit. I started mine mid afternoon and it was done by dinner time. Unless you set a timer or have someone put the crock on in the afternoon this is not a good recipe for starting in the morning and having dinner at night. But for a day when you are home this works. I could totally see me throwing everything in the crock in the morning, stashing it in the fridge then calling home to have the teen put it in the crock-pot base and turning it on. Anyways…try it, it’s good and cheesy! 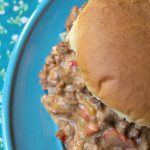 Cheesy sloppy joes on your favorite brand of hamburger buns or rolls is the perfect dinner when you need something tasty and simple for dinner. This recipe is a huge hit with the kids for dinner or lunch! In a large skillet add the ground beef, diced onion and diced bell pepper and cook until the meat is browned, crumbled and no longer pink. Drain meat to remove fat. Add the cooked meat mixture to a 4 to 6 quart slow cooker. Cover and cook on LOW for 2 to 4 hours or until all the cheese is melted and the vegetables are tender. 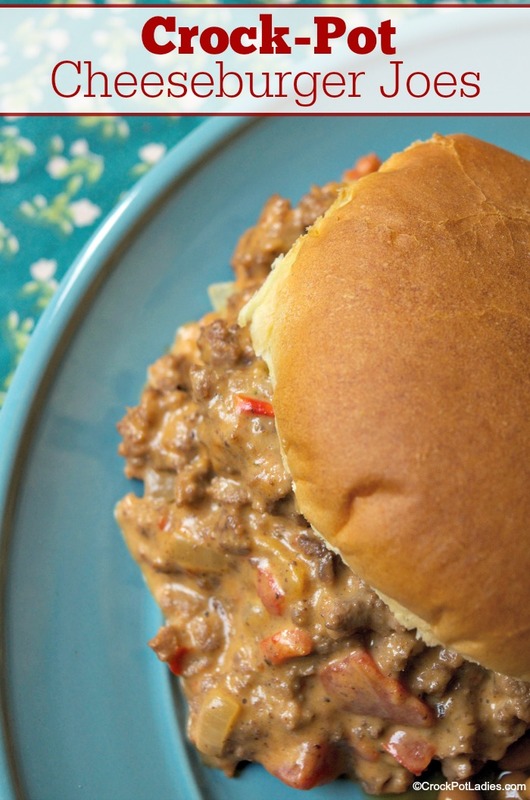 Serve on your favorite hamburger buns or rolls. *You could easily substitute ground turkey or ground chicken for the beef. **You can find Barbecue Seasoning at most grocery stores. I used McCormick brand. If you cannot find it, add a squirt or two of BBQ sauce, or just omit it. I am sure it will still taste great! ***Nutritional information and Weight Watchers points calculated based on the recipe as written and does not include any buns or rolls that you may serve the cheeseburger joes on. Sounds yummy! 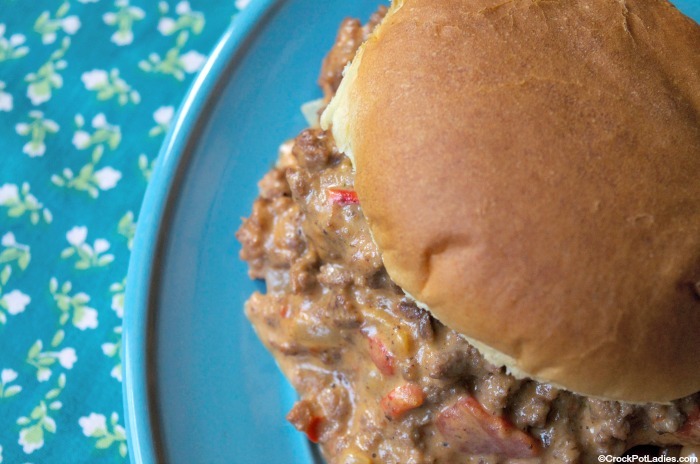 We LOVE velveeta, burgers and sloppy joes!! I have half a block of Velveeta in my fridge right now! Definitely pinning this one! I started prepping this in the morning and turned it on right before I went to work (only a few hours) and it was perfect for dinner when I got home. I absolutely LOVED this recipe! I liked it because it was a lot more cheesy than Sloppy Jo’s without that strong BBQ taste, which I don’t care for. This will forever be my go-to when I’m feeling like having a filling sandwich. I also loved it because I’m just starting out cooking and it was actually super duper easy. Glad you liked! They are a great family pleaser. You could also make more and freeze for later.